Cinco de Mayo is upon us!! Get extra excited because it’s about to be a gorgeous weekend! (Unless you’re in Chicago. Sorry Chicago.) It’s time to don your sombrero, grab that margarita, and… work on your authenticity. First things first, you’ll need to know the most missed fact about Cinco de Mayo: It is NOT Mexico’s Independence Day (*cough* September 16). Read up on the history behind this weekend’s giant celebration on the internet’s most trusted source for information, Wikipedia. Now back to your authentic Mexican fiesta. (You didn’t know you were hosting? Whoops!) You’re going to need some food. We’ve got you covered with one of the top Mexican staples out there. Can you say fresh, handmade tortillas?? Yes, yes, we’ll give you a complete, tasty taco recipe, but the real star here is the tortilla. Soft, yet firm, thicker than the mass manufactured tortillas you’ll find at grocery chains, and with subtle flavor that won’t overwhelm the juicy steak and tangy pico de gallo – it’s the perfect vessel! Just so you know, we picked this recipe out of all the latin recipes in our library. It’s been taste tested by the most discerning of pallets at our corporate events and team building off-sites in San Francisco, Chicago, Seattle and Portland. Trust us, it’s a good one. Enjoy! Marinate Steak: Combine the spices into a bowl. Stir to combine. 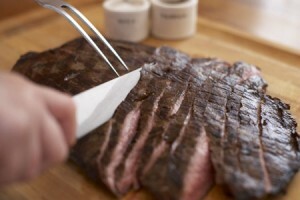 Trim the flank steak of silver skin. Lightly score the meat with the tip of a knife. Rub the entire steak (front and back) with the spice mixture and olive oil. Set aside to marinate for at least 20 minutes. Make Dough: In a medium bowl, mix together the flour, salt and baking powder. Add the oil, a little at a time. Mix with a fork or your hands until the dough is crumbly. Slowly pour in the hot water and continue to mix with until the dough starts to come together. At this point, start kneading dough in the bowl until it is smooth and elastic and no longer sticky. You may need a little more flour. Cover the bowl with a kitchen towel and let rest for 20 minutes. Pro Tip: You can expedite this process by using a food processor fitted with the dough or steel blade. Pulse the flour, baking powder, and salt. Slowly pour in the oil, pulse until the mixture starts become crumbly. With processor running, slowly add the hot water and mix until a ball forms and starts traveling around the sides of the bowl. Process the dough for about 30 seconds. The dough should clear the sides of the bowl and be soft but not overly sticky. Transfer the dough to a floured board and cover with a kitchen towel for 20 minutes. 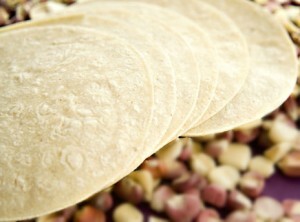 Roll and Cook Tortillas: Pre heat a flat griddle pan over medium-high heat. Cut the dough into quarters. Cut each quarter into eighths to yield 32 small pieces about the size of a large grape. Cover them with a kitchen towel to prevent them from drying out. With a rolling pin, roll out the dough into a very thin, almost see through circle, or as close to a circle as possible. Immediately place the tortilla onto the hot griddle. Only roll out as many tortillas as will fit on the pan at a time or they will start to dry out while they wait to be cooked. Cook on one side until you see bubbles forming on the surface. Flip and cook on the other side until soft bubbles form again. You will see light brown spots form. Repeat process. When the tortillas are cooked place them into a tortilla warmer to keep them hot or into a bowl covered with another kitchen towel. Grill Steak: Once tortillas are cooked, flip the griddle pan over to the ridged grill side. Once the grill is smoking hot, sear the steak for about 4 minutes per side. Remove the steak from the grill and let it rest under foil for 5-10 minutes before slicing. Broiler Alternative: Place marinated steak under a broiler for 4 minutes, flip, and broil another 4 -5 minutes. Do not slice until ready to serve. Make Pico de Gallo: Remove stem end and chop the tomatoes into small dice. Place tomatoes and all of the juice into a medium bowl. Chop the jalapeno and cilantro and add to the bowl. Chop the red onion and place into a sieve. Rinse the onion under cool running water to remove some of the onion fire. Shake off excess water and pat dry with paper towels. Add the onion to the salsa along with the salt and the juice of one lime. Mix, taste and add more salt and lime juice if needed. Make Vegetarian Alternative: If you have some vegetarians, remove some pico de gallo from the bowl and make a Black Bean Pico de Gallo. Simply add some canned rinsed black beans to the salsa. Mix well, taste and adjust seasoning if necessary. Assemble: Slice the steak in half lengthwise, with the grain, and then THINLY slice each half (should yield about 65 very thin slices See chef for demonstration on how to slice.) Place a couple strips of steak onto a tortilla. Top with a heaping teaspoon of the pico de gallo. 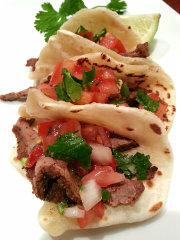 Place little tacos onto a platter and garnish with lime wedges and cilantro. For vegetarians, spoon the black bean pico de gallo onto the tortilla and serve on a separate platter.